One of the most significant challenges for asset-intensive organizations is how to effectively manage their different types of assets. EAM software helps do this without creating a backload of management tasks that can impair efficiency. Every asset has a lifecycle. The key to effective asset management is knowing where a particular asset is in its lifecycle at any given moment and whether it is providing value to your business. If you know the current state of an asset, then you can intelligently plan and budget for updates, replacements and other changes in that asset’s lifecycle. Asset lifecycle management (ALM) is the process of optimizing the profit generated by your assets throughout their lifecycle with a combination of management, tracking, performance and monitoring features. Users can also manage and track the contracts made in regards to their assets. This module can track and record negotiations of terms and conditions, adherence and changes to those terms and conditions, involved parties, etc. It should offer contract creation features (potentially prefabricated templates or the option to create custom forms) and other functionality to manage the lifecycle of a contract. A work order involves authorization of maintenance, repair or operations work to be completed. Work orders can be manually generated through a work request submitted by a staff member, client or tenant or automatically generated through a work order management software or Preventive Maintenance (PM) schedule. EAM applications offer work order management features that streamline and automate the process of submitting, processing and closing work orders. 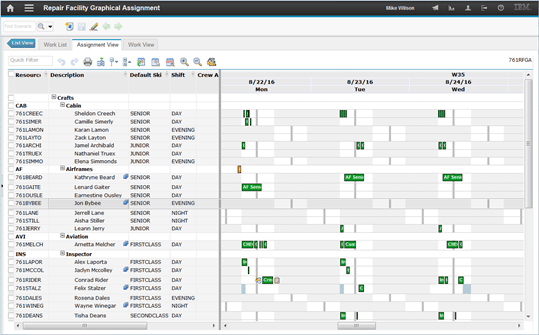 Many offer role-based access to restrict permissions for closing work orders to admin users. One example of a work order management module is purchasing requisition, which generates documents to notify purchasing departments of order requirements. By incorporating this feature directly into the EAM, it prevents the need for employees to communicate with an additional software system, email or written medium, consolidating communications. Inventory management is the management of inventory and stock. For EAM, this will include spare parts and other equipment used in maintenance activities. Inventory management includes aspects such as controlling and overseeing ordering inventory, storage of inventory, and other organizational tasks. One feature inventory management modules offer is supplier information management (SIM). An SIM retrieves, organizes and manages supplier information to minimize risk and increase efficiency in communications with vendors. Users of EAM software can also keep their inventory metrics in order in the same convenient location with stock level metrics tracking and management features, including inventory transfers and substitutions. EAM software also eases the process of lot control and serialization by standardizing, automating and streamlining the process. Inventory management isn’t restricted to finished products either — it can create and manage bills of material (BOMs) to ensure correct communications between manufacturers, producers and clients, or user and maintenance technicians. This can all be done both for single-site operations or globally with multi-site inventory management capabilities. Maintenance management is exactly what it sounds like: managing the maintenance of your assets. It consists of tools, technologies and methodologies that a company uses for repair and maintenance activities. Augmenting maintenance tasks with a maintenance manager helps users ensure regulatory compliance and track warranty information to prevent costly mistakes before they happen. This feature also helps automate some of the more repetitive tasks involved in maintenance upkeep. Users can save time and data entry with custom template creation. Users can rest easy knowing their assets are being taken care of in a timely manner with a combination of preventive maintenance scheduling and fault management features. Fleet operations are capital-intensive, and success hinges on how well you can track and manage your vehicles. With that out of the way, users can capitalize on opportunities for productivity and cost-per-mile savings. With all the pressures enterprises contend with to deliver optimal results, proactively managing asset performance is critical. Vehicle maintenance includes a range of features that maintain and monitor vehicle assets. Like maintenance management, this feature gives users peace of mind by maintaining records and schedules for necessary repair tasks. MRO (maintenance, repair and operating supply) items are used in production and plant maintenance and can be items such as maintenance supplies, spare parts and consumables used in the production process.These items can be either valuated or non-valuated and depending on the value of the items, no physical inventory is performed. Since MRO items aren’t typically managed by enterprise resource planning (ERP) tools, materials resource planning systems (MRP) or warehouse management systems (WMS), admin employees are often tasked with placing orders with MRO suppliers on an as-needed basis. Getting a system that does streamline this task can prevent data duplication caused by multiple systems and improve your overall workflow. Materials management is a logistical function that manages all the raw components of a supply chain. It oversees the overall management of raw materials, parts and other components that go into creation of a product that is then sold and shipped to end users. A competent materials manager is crucial to supply chain management, but the qualities or skills required of a good materials manager vary considerably and depend on the complexity of the company. A multinational Fortune 500 company that produces multiple products will have far more complicated requirements than a company that produces a single product for a regional or local market. A materials management module can include everything pertaining to the planning and control of the functions supporting the complete cycle of materials and the associated flow of information. Some of these functions include identification, cataloging, standardization, need determination, scheduling, procurement, inspection, quality control, packaging, storage, inventory control, distribution and disposal. Business intelligence (BI) is a technology-driven process for analyzing data and presenting actionable information to help users make informed, data-driven business decisions. Many enterprises utilize a separate BI tool that can offer incredibly detailed reporting and analytics capabilities, but that isn’t necessary for everyone. This is especially true now that many other types of software offer reporting and BI capabilities tailored to the specific needs of the users of that kind of software. The reporting in EAM is a good example of this. Instead of offering the whole banquet of BI options, EAM BI features target asset management reporting functions like fault site reporting to identify areas where assets may fail. Users can also create custom key performance indicators (KPIs) to make the reports they generate more valuable to their specific needs. Facilities management software is a subcategory of computerized maintenance management systems (CMMS) that focuses on the repair and maintenance of an organization’s facility/facilities in addition to its assets. The goal is to help you manage your buildings, spaces and occupants more efficiently. Facility condition monitoring is the process of keeping an eye on a facility’s condition. By constantly monitoring instead of sporadically assessing any buildings you control, you can stay on top of problems as soon as they’re noticeable instead of catching them when they’re serious. This saves money in the long run and keeps your facilities in tip-top shape. Automatic meter reading (AMR) is the process of automatically collecting consumption, diagnostic and status data from water or energy metering devices. Then that data is transferred to a central database for billing, troubleshooting and analyzing. AMR technology saves utility providers the expense of periodic trips to each physical location to read a meter, saving you the expense of paying for that service. Another advantage is that billing can be based on near-real-time consumption rather than on estimates based on past or predicted consumption. This timely information coupled with analysis can help both utility providers and customers better control the use and production of electricity, gas usage or water consumption. It’s better for your pocket, better for the planet, better for everything! Reservation summaries are also exactly what they sound like. Any time a reservation is made in a space, the EAM will log it. Those summaries are easily accessible after they are made to streamline workflows and incorporate facility availability functionality. In the modern world, very few people will be satisfied with a desktop-only system that can’t be accessed outside a control hub. Integrations are the ability of a software to communicate, import, export and connect with other information sources. These can include websites, ERPs, CMMS systems or other software. Some EAMs will have native mobile apps to make connecting on the go a breeze. Mobile usability within certain browsers is more common and no less useful. This is especially crucial for organizations with mobile assets or fleets. Integrations with HCM systems can make the lives of your HR staff and employees much easier. Integration makes any onboarding and HR portals easily accessible from a single interface. This is one of many ways to boost your workflow optimization. Now that you know what to look for in an enterprise asset management software, check out our comparison matrix to view top EAM software solutions side-by-side to select the right solution for your business. Did we miss any enterprise asset management requirements in our checklist? Which do you think are the most crucial for EAM vendors to include in their platforms? Let us know your thoughts in the comments!